Incase you’ve somehow missed the memo, velvet is having a very huge moment. 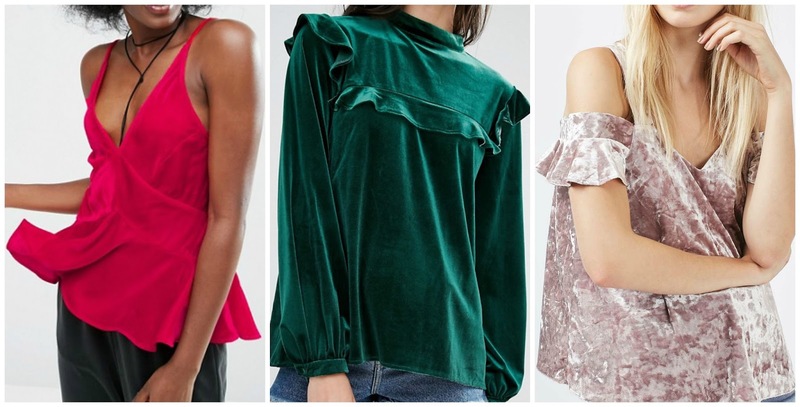 One of the biggest trends, and textures, from the autumn/winter catwalk season, Velvet has made a huge imprint on the high street with everything from scrunchies to sock boots available in the fabric of the moment. With plush, draped, ruffled, pleated and crushed options in every imaginable shade and cut there’s a style for absolutely anyone and everyone. I picked up this fun top from an Asos sample sale,like all sample sale’s it was pretty mad and I didn’t realise until I’d got home and searched for it on the site that it’s actually from their Curve range. As I’ve previously mentioned on my YouTube channel, I never really judge garments on their size, and instead pick and purchase pieces rather how they look on and fit as there’s often such a disparity between stores sizing. I’m assuming that this top is actually an 18 which, on me, works as a slightly longer oversized top and love how through upsizing it accentuates the ruffles further. To play about with the proportions, I’ve been wearing it with the sleeves rolled up, skinny black jeans and my new patent boots.